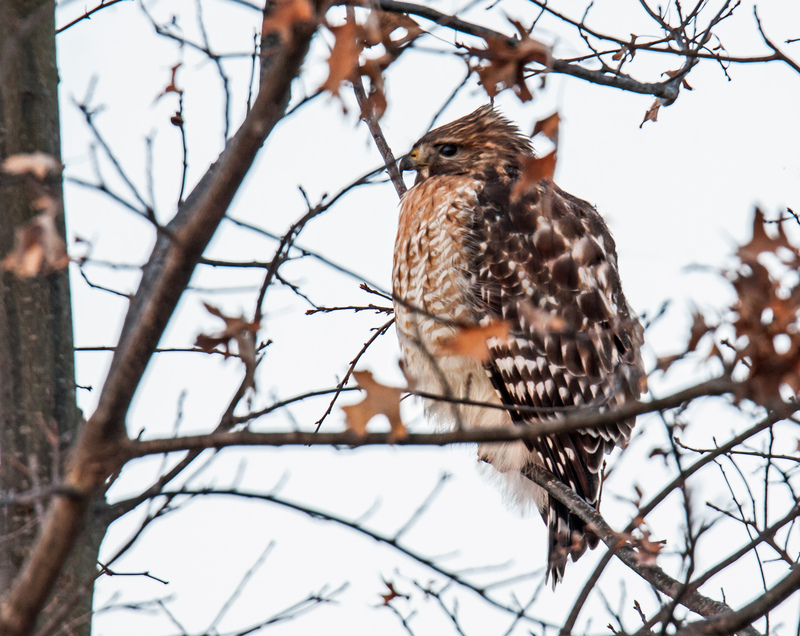 This Red-shouldered Hawk (Buteo lineatus) was so puffed up early last Saturday morning at Occoquan Bay National Wildlife Refuge trying to stay warm that I couldn’t even see its feet—it was about 18 degrees (minus 8 degrees C) when I captured the image. The hawk seemed to be hunched over a bit and it looks like some of its lower feathers were draped over its feet. Nice capture and smart hawk! But really, 18 degrees—my idea of staying warm would be to stay home. 🙂 I like to venture out in inclement weather, as long as the roads are clear. I have enough gear that I can stay warm and it is fascinating to see which creatures are still stirring when it is cold or damp or snowy. Staying warm is key and is interesting to see how the creatures get through their day. I’m in Maine for a few days and it is snowing and blowing, reminding me why I moved south! on February 6, 2019 at 9:52 pm | Reply Molly D.